From marching gay rights supporters, to the lock up in 1988, to marching in the TasPride Parade in 2015; we’ve come a long way towards embracing diversity. 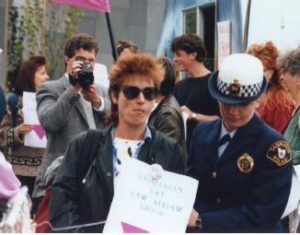 More than 100 people were arrested at Salamanca Market in 1988, protesting against a ban on a market stall collecting signatures for a gay rights petition. Now, in that same location, Tasmania Police officers are proud to stand alongside members of the LGBTI (Lesbian, Gay, Bi-sexual, Transgender and Intersex) community in support of the TasPride Parade. 2015 was the first time police officers in uniform took part in the Parade, and they were led by Commissioner Darren Hine. number of Sergeants are trained as LGBTI liaison officers. “We are a modern policing service with a strong commitment towards human rights and diversity in our community,” said Commissioner Hine. “Tasmania Police has made significant progress over a number of years in building strong relationships with the LGBTI community. “We seek to lead by example, influence behaviours, and demonstrate Tasmania Police’s commitment to value and respect,” Supporting Commissioner Hine said. 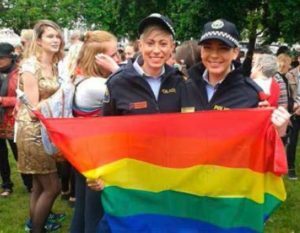 Above left: Senior Constable Desi Amerikanos and Constable Caitlin Cashion at the 2015 TasPride Parade (photography by Tracey Wing). Above right: Protester under arrest in 1988 (courtesy of the Tasmanian Museum and Art Gallery). This page -- https://www.police.tas.gov.au/about-us/100-years-women-policing-tasmania-police/agents-of-change/supporting-diversity/ -- was last published on January 17, 2018 by the Department of Police, Fire and Emergency Management.